You are here: Home / Human Interest / Obama funded by the..? 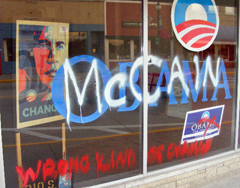 Some not very well executed political vandalism has cropped up in western Wisconsin. 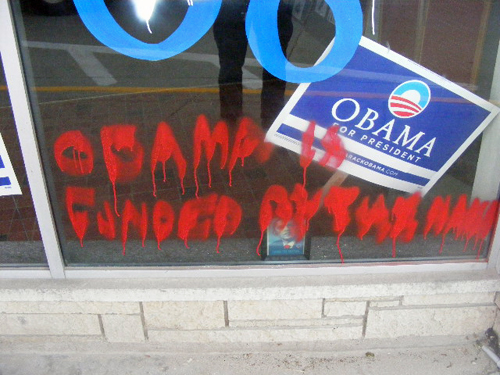 A spray painting vandal in Viroqua didn&apos;t plan ahead, using red paint to put a big X on a campaign sign at the local Obama headquarters. Along with the words wrong kind of change , the tagger painted himself into a corner. Police Chief Mark Rahr says the last word in the phrase Obama is funded by the is illegible. "The paint was running," says Rahr, "so, it&apos;s not exactly sure what the last word is." Rahr thinks it might be man , as in Obama is funded by the man . The less than talented graffiti artist also noted John McCain&apos;s military record with the words McCain is a vet . Rahr says the vandalism happened on Viroqua&apos;s Main Street, in broad daylight.